I knew of The Satanic Verses by reputation only. 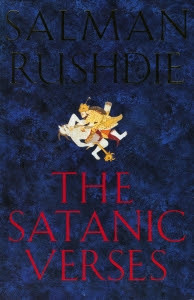 I knew nothing about the characters, the plot, the genre, just that this was the book that led the Ayatollah to issue a fatwa against (and place a bounty on) Salman Rushdie. Rushdie spent years in hiding under an assumed name, his book was (and I believe is still) banned in many parts of the world, and some translator's of the book have been the victims of not always unsuccessful assassination attempts. How offensive could is this book? The novel starts with the two main characters, Gibreel Farishta and Saladin Chamcha, falling from a plane that exploded over the English channel. We get into the magical realism and metafiction right away, as the narrator breaks the fourth wall and the two men access some greater power to survive the fall. But this is not without its consequences. Gibreel is a Bollywood superstar, a big budget hero who can do no wrong, and has bridged national tensions by playing deities across religions. From a poor upbringing amid the streets of urban India, he became a symbol of Indian culture. Saladin Chamcha, the son of a wealthy Indian businessman, left for London as soon as he could and made a concerted effort to become part of proper London society. Saladin changes into a manifestation of shaitan (i.e. Satan), horned, hoofed, furry and large, while Gibreel becomes angelic, with a literal halo (think renaissance art of a circle of light emanating behind the head, not a ring floating above the crown). Gibreel also finds himself becoming, in his dreams at least, the archangel Gibreel. In Muslim traditional lore (I think apocrypha, it's hard to find unbiased information; in any regard, this is not int he Quran itself), Muhammad included a set of verses allowing for prayers to three Meccan goddesses, later redacting the verses with a claim that they were not given him by Gibreel but by Shaitan. Within the context of the novel, Muhammad received both the verses and their repudiation from Gibreel. However Gibreel discovers that the information that he passes on to those who seek his intercession comes not from him, but largely from the person who believes he/she is receiving the information. While faith is a big part of the novel (and I'll get back to it), the main story is about the relationship of Indians and Great Britain. If we must dive into taxonomy, we're looking at a great work of post-colonial literature, one that dives into the what it means to be an Indian and a Brit. Much of Saladin's character is rooted in this identity crisis, his constant attempts to become proper English, his resentment of Gibreel's acceptance in England, etc. Even moreso than his metamorphosis, Saladin Chamcha's major concern is his personal status and cultural identity. As much of the book deals with the role of British residents from across the empire as with the religious faith of the protagonists. But to get back to the faith issue, Rushdie actually provides a complex and often ambiguous approach to the religion of his birth. At different times, religious faith is condemned or vindicated; miracles occur, of the malevolent and beneficent kind. Perhaps the only religious attitude that is universally admonished is violent extremism. But what of blasphemy? There are characters that would certainly be considered blasphemous, most notably the characters who were directly opposed to Muhammad himself, and the brothel whose whores took the names of the Muhammad's wives to draw up custom. But, of course, what constitutes blasphemy in Iran or other fundamentalist societies is very wide-reaching. The Satanic Verses has been brought into the battle of freedom of expression as the flag carried the standard-bearer. It's a great book that investigates ambiguous and contentious social issues in a manner that is, well, ambiguous and contentious (but in a good way). Speaking of ambiguous, I'm trying to figure out exactly what this review series will really be about. With the previous series, I went into each post asking how and why that book became the bestseller of a particular year. Now? I'm not sure yet. Maybe I'll get a bit more free-form, see where my thoughts take me with each entry. Other appearances on ML list: Rushdie's Midnight's Children (1981) appears as #90 on Modern Library's official top 100 list.